My earlier feature article was to find out “Who is Kwaku Ohene Frimpong” as there are many Ghanaians making a difference and having an impact in our community but are not getting the recognition they deserve and it is my desire to make sure that these unsung heroes are recognized. Moving along to our next feature, the National Council of Ghanaian Associations of New York (NCOGA) recently elected its new executives. One person made history and became the first woman to be elected Deputy Executive Secretary. This particular individual is; ROSE IVY QUARSHIE of Queens, NY, USA. Born in Keta in the Volta Region and had her secondary school education in Accra, Ghana. 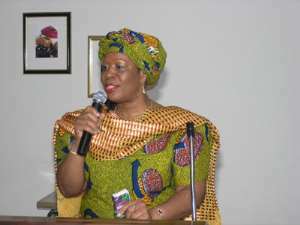 She worked briefly with the Ghana Cocoa Marketing Board in the Public Relations Department before migrating to the United States. Since she can remember, public service has been Rose Ivy Quarshie's calling. She has dedicated herself to numerous causes over the years that her current role as Deputy Executive Secretary General of the NCOGA is a testament to this dedication. With a Master's degree in Public Administration, concentrating in Finance, Ms. Quarshie has used her expertise quite fruitfully and decisively at work and in her community service. Prior to her current position as Deputy ESG, Ms. Quarshie was the Financial Secretary and Treasurer of NCOGA for the past six years respectively. As a Secretary of United Volta Association for over 8 years, she was very instrumental in the inauguration of the association and various initiatives which has made the association a go-to association in the tri-state area. She was also instrumental in the creation and leadership of the CEANA. (Council of Ewe Associations of North America) Ms. Quarshie is always the indefatigable organizer who draws upon her organizational and interpersonal skills to make sure all events are planned and executed with diligence and success. Her commitment to her community service goes beyond these cultural organizations to include her leadership in JP Morgan Chase's Global Day of Service activities where she organizes coworkers to perform community services in NYC neighborhoods. Now as the Deputy Executive Secretary General of NCOGA, Ms. Quarshie hopes to assist the Executive Secretary General in revitalizing NCOGA into the spotlight in order to be a force to be reckoned with, with other umbrella organizations both here and abroad. She wants to use her position to highlight issues facing women and also to fight for such issues to be addressed or recognized. She also wants to encourage other women to take leadership roles in order to improve upon the condition of our communities. Ms. Quarshie is also currently an Assistant VP at JP Morgan Chase in New York. Having known Ms Quarshie over the years, I would like to once again mention that her resilience and commitment to public service is par excellence. Mr. CNN of Ghanaweb says Ms Quarshie, more grease to your elbow. Continue to be a role model to the Ghanaian woman today worldwide.